"Roadpro 12V Hot Pot, 20 oz." Fully functional coffee maker for coffee on-the-go. Anti-drip valve. Schumacher 1229 12V Coffee Maker. Fully functional coffee maker for coffee on-the-go. On/Off switch. Model Number: 5021. Manufacturer Part Number 5021. Product Model 5021. Outer Lid Can be Used as a Cup. Holds Up to 20 Ounces of Liquid (600ml). Product Information. Weight (Approximate) 2 lb. Auto Coffee Maker. 12 volt plug for car, camper, boat. This item was pre-owned new in box. Item has a small spot on the top lid where it looks like it was rubbed in the box as pictured. Is NEW IN BOX, NEVER USED. DALE IS FINAL ! Digital LCD temperature display and easy to set the exact temperature you want. Display type: Digital LCD display. Main Features High model current: 8A max. Low model current: 6A max. Capacity: 350ml. 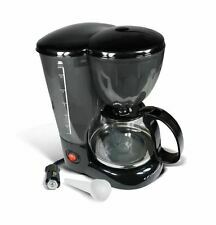 12-Volt Coffee Maker with 20oz. Glass Carafe. Stop-drip interrupt feature when carafe is removed. Brews 20 ounces of coffee in under 20 minutes. 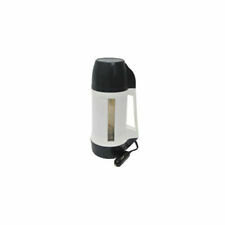 Fully functional coffee maker for coffee on-the-go. Anti-drip valve. On/Off switch. SMART MUG 16oz KEEPS BEVERAGES HOT WHILE YOU TRAVEL!! BRAND NEW MIB!! 16oz smart mug plugs into your car lighter. TOOK LOTS OF IMAGES SO VIEW THE OVER SIZED IMAGES FOR BEST RESULTS. Fits most cup holders, ideal for travel use. Sliding lid reduces the risk of spillage. Capacity: 450ml. 1 x Stainless Steel Kettle. 12V connector to connect to the cigarette lighter socket. Fits most cup holders, ideal for travel use. Material: Stainless steel Plastic. We will try our best to reduce the risk of the custom duties. It can maintain 5-55 degrees in heating mode and -5 to 5 degrees in cooling mode. When you press the cooling button, the blue LED lights up and the cold insulation works. Cooling /Warming. In order to be able to correspond to the permanent drink holder of more models, one more holder stand is attached. Outer lid can be used as a cup. Holds up to 20 oz. of liquid (600ml). Plugs directly into cigarette lighter socket. Fully functional coffee maker for coffee on-the-go. Anti-drip valve. They can not have been assembled and disassembled. Fully functional coffee maker for coffee on-the-go. Schumacher 1229 12V Coffee Maker. Anti-drip valve. New Schumacher 1229 12V Coffee Maker by Schumacher. Fully functional coffee maker for coffee on-the-go. Part Number. We know that you want to save money but you don't want to get cheap goods. We use several practices to ensure you are getting only the best, at a great price.